Spring is here - time to hire your Yorkshire Limo! It's that time of the year again, spring has sprung and the weather is getting better so this means you need to get your limo hire action going on and get down to Ultimate Limos Yorkshire for the best limos, American Limos, wedding cars and so much more for all the major cities and towns in Yorkshire and South Yorkshire. We have been working hard to keep our limos tip top and will be working even harder throughout the summer to make sure that you guys get the best wedding car hire Yorkshire has to offer. Ok, so proms are coming up - it's the end of season where the schools in Yorkshire are breaking up and you need a limo to get you to and from the proms. Imagine getting a dreary mini bus! What's the point! There is none whatsoever when you can hire a limo for the same price, get all your mates in, your favourite tipple and favourite tunes and get to the proms in style. Also, as the nights draw longer, cruise through Yorkshire with the windows down, let everyone know you're having it large on the town and get involved with some of Yorkshire's best limos, you will be the envy of everyone. So, have fun this spring, jump into an Ultimate Limo Hire limo and arrive in style to your next event. Whether it’s for a birthday, hen do or stag night or just nights out on the town, why not add a bit more fun to the night with a limousine hire in York, Rotherham or anywhere throughout Yorkshire. If there are many of you going out for the evening, then a limo hire can be cheaper than a standard minibus, but you'll arrive in style! Many of our limos seat from 8 to 16 people, so knowing in advance numbers will help us decide on your limo hire needs and which limo will be more suitable for you. WHAT DO YOU WANT INSIDE YOUR LIMO HIRE? Each of our limos comes with it's own luxuries such as bubbly, party music, AV sound systems and we can customise for the needs of your party. Just speak to us directly during the booking stage and we will take care of the rest. You can view all our limo hire vehicles online so you can make you choice there, all our limos on our site are exactly the same limos we hire out, so the limo you choose, is the limo you get. Making sure you know where you will be be picked up from and where you want to go when you make your booking. When you have made your booking, always call back a few days before your event to double check the timings. Check out and do your homework with the limo hire company to make sure they have good reviews. Always read through the terms and conditions of the booking. Ask about the payment methods, is the deposit refundable? You will need to make sure there are no hidden costs too. Ultimate Limos Yorkshire have a huge fleet of limos for hire in Rotherham, York, Dewsbury and throughout North Yorkshire, West Yorkshire and the UK, each limo hire comes with a professional chauffeur to pick you up from the pick up point and pick you up from your chosen event. Great for weddings, days out, corporate, proms and much more. Enjoy the best Ultimate Limos have to offer and book your limo hire today! Well 2016 was a brilliant year for Ultimate Limos Yorkshire, we have brought on many new types of limos and worked tirelessly throughout the Yorkshire areas to provide you with the best limo hire Yorkshire has to offer. For 2017 we are looking to expand on our huge array of limousines with even bigger and better bolder limos for hire, so if you live in Leeds, Sheffield, Rotherham and throughout the Yorkshire areas make sure you get in touch with us for the best quotes in the area. From us all at Ultimate Limos Yorkshire, we want to wish you all a Happy New Year and a great 2017! Here at Ultimate Limos we understand that when you hire a limo you need it to be a head turner otherwise what's the point right? 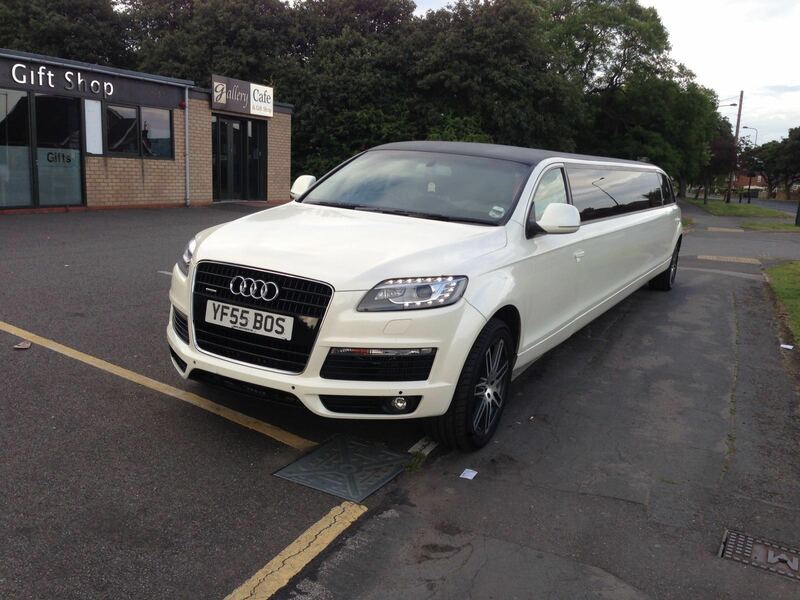 With us having one of the few Audi Q7 limos in the country (probably even Europe), this limo delivers and makes you feel like a star on your nights out around Yorkshire. The Audi Q7 Limo is available in phantom white too, so it really stands from the crowd and with the 22 inch alloy wheels and all the trims will make sure you arrive at your event in style. The Audi Q7 limo can seat up 14 people and you can choose your own music for the state of the art sound system that pumps out tunes like a mobile club. Want our dedicated limo hire Chauffeur to bring you and your guests champagne too? Then you can just request that and we can cater for it as well as any other needs like ribbons, red carpets etc. The interior of the Audi Q7 limo is unparalleled with stunning leather curved sofas, designer neon lighting effects that moves in time with the music and the smoothest ride by a trained chauffeur driver. Have a look at some of the images below and if you are looking to hire a limo that really turns heads, then make sure you get in touch with us and get your free quote - you will not be disappointed. Ultimate Limos are a leading limo hire company based in Bradford providing limo hire services throughout Rochdale, Harrogate, Dewsbury and York and throughout the whole of Yorkshire and UK. Great for days out, nights out and corporate and hospitality, we have a huge fleet of limos for all occasions and needs. It's going to be a white Christmas this 2016 or so they say - here's to hoping. Ultimate Limos are going to be getting booked up throughout the festive period so if you are planning that office party, festive party or just want to get to the venue in style then make sure you get in touch with us today. Our limo hire is available throughout Huddersfield, Leeds, Sheffield and throughout the whole of Yorkshire and Midlands. No matter what you need for this Christmas, make sure you get your limo hire booking early to avoid disappointment. Our limos will be out about over Christmas - make sure you are in one of them! Welcome to limo hire UK, the professional and reliable limo hire York, Rotherham, Dewsbury and Yorkshire.